Sticky Date Pudding is one of my mum’s best desserts. She has turned it into an art form that few restaurants can come close to matching in my book. The texture of the pudding and the richness of the caramel butterscotch sauce is a combination of rare and special beauty that can be the perfect ending to a great meal. So doing my usual trick of butchering good food with my own shoddy attempts at making them, I went off and tried to make it myself. I didn’t have time to get the recipe off mum, seeing as it was already about 9:30pm when I decided I was going to cook it, and so I went off to the net to find a recipe. I did my usual trick of combining the essence of about 15 different recipes into my own unified Jeet Kune Do (“I have developed a form of fighting with NO fixed positions!”) style sticky date pudding recipe. As an interesting addition, I thought i’d make the sauce with honey, and funnily enough, after reading JenJen’s list of 5 things to eat before you die, I happened to come across a small tin of Tasmanian Leatherwood Honey in Fresh Provisions Mt Lawley (who incidentally also have Black Summer Truffles ! ), and I thought i’d give it a try. Rummage through your cupboards until you find the one baking dish you bought a few years ago with all good intentions of using to make cakes and the like. Rinse out the dust it’s been collecting and then smear the insides with butter. Sprinkle flour inside and chill in the fridge. Or alternatively, get new age fancy style silicone containers and not bother at all. Preheat your oven to 180C. Chop up the dates and simmer in a pan with the water and orange juice for 5 minutes. Take it off the heat, stir in the baking soda, and watch a glorious volcanic eruption of foamy goodness. Sit that aside for 20 minutes or so while you prepare the rest. Resist the temptation to taste it, because this mixture is kinda nasty at this point. While that mixture is standing, into a bowl sift together flour, baking powder, and a pinch of salt (i may have even added a pinch of nutmeg or cinnamon here, just because it felt right). Meanwhile back at the ranch, in a large bowl with an electric mixer, beat together butter and sugar until light and fluffy. Then beat in the eggs in one at a time. Add flour mixture in 3 batches, beating after each addition until just combined. Add date mixture and with a wooden spoon stir batter until just combined well. Pour batter into your pan and put it into a bane marie (larger pan/tray filled with water) with enough hot water to reach halfway up the sides of smaller pan. Slide it carefully into the oven and bake until a metal probe comes out clean, which I found was roughly 45 minutes. In a heavy saucepan melt butter over low heat and add brown sugar, then carefully pour the honey in. Turn up the heat and bring the mixture to a bubble, stirring occasionally, then stir in cream and vanilla. Stir it around for a few minutes until its thick and smooth. 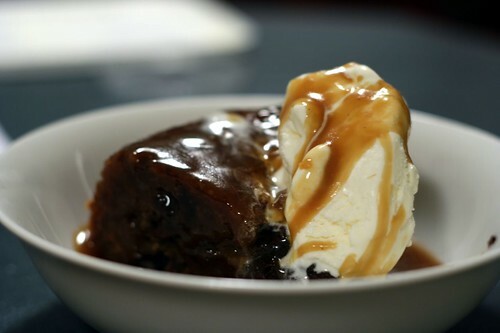 Serve straight away by cutting a sizeable chunk of pudding and smothering it in the sauce, with a good helping of cream or ice cream on top to help assuage your stomach from the heavy onslaught of the determined forces of pudding and sauce. There are few quintessentially drool inspiring scenes to rival the humble pancake stack. Topped with cream, honey/mapel syrup flowing down the sides like a slow moving volcano of sweetness. It is the kind of breakfast (or dessert) that makes you feel glad you put in the effort to cook it, rather than lying in bed those few extra hours, waiting for the throbbing headache of the night before to subside. My earliest memories of pancakes (or to be specific pikelets) was Mum cooking up big batches of them on a Saturday morning, using the top of our Kent wood fire back in NZ. It would get so hot that you could literally cook on top of it, so on would go a pan and batch after batch of pikelets would be poured, flipped, and devoured just as fast as Mum could make them. So these pancakes follow in my great tradition of never eating a proper breakfast except for the weekend. There really just isn’t enough time or patience on my part during the working week to be able to give the meal the love and attention it so richly deserves. The recipe is a little tarted up from Mum’s original, but stays true enough to the simple home cooking philosophy. Couldn’t be too much simpler really. Basically sift the dry ingredients together and mix well, then add the wet stuff. The eggs add the nice golden colour, and the vanilla bean extract adds a lovely mottled effect in the batter from the little seeds. Stir it all around and get rid of any lumps until you get a nice smooth creamy consistency. Let the batter sit for a little while so the baking powder can do it’s magic, and then start to pour the batter into a hot buttered pan. The trick to getting nice round shapes is to always pour into the centre point of the pancake, and let the batter settle itself in the pan. Then away you go… Watch the batter for signs of bubbles starting to appear, and you’ll know when they’re ready to flip. I highly recommend using a good flat spatula and a nonstick pan to save yourself some hassle. Once your pan is hot, it will take literally seconds for the pancakes to start bubbling… most taking a maximum of a minute or so to be completely cooked. The most important thing about pancakes as far as I’m concerned, is eating them while they’re hot. If you have to wait to get them onto a plate, then be sure and lather generously with maple/golden syrup/honey, fresh berries, cream, ice cream… anything you can think of really…personally straight out of the pan and into the mouth is ideal, do what I do and take a mouthful of cream and honey beforehand so you’re not wasting valuable seconds while transferring them from spoon to mouth :) (Nb: this is not encouraged behaviour for polite social gatherings). There’s something about a nice rack of lamb that makes it hard for me to pass by, when idlely drifting through butchers shops, purveying their cuts. Lamb is one of my favourite dishes full stop, but to be able to combine it with a ready made handle AND have it look classy on a plate at the same time, is just genious. So this was a pretty simple dish I made up on the spur of the moment (read: spent all day thinking about and scouring the web for ideas), which I think turned out just dandy. So firstly, cut down into your lamb rack a little and stuff every concievable orifice you can find with fresh rosemary, salt, black pepper, and libations of olive oil. Score the fat on the back of the rack, and rub that down with salt and pepper too. Now crank your stove up to high and sear your lamb rack in a healthy dose of olive oil in a hot pan. Make sure you give it a good covering so that the tricky parts all receive a fair amount of heat, and then when it’s looking charred to perfection, drop the heat, and put it into the oven to continue cooking through til done. Keep the pan juices as we’ll use those for the sauce. Once the lamb is away in the oven, peel and slice your sweet potato and fennel. Get the sweet potato boiling in a pot of salted water, and braise the fennel in a little white wine and butter over a low/medium heat so it softens up. Once the sweet potato is cooked, but not mushy, drain the water and mash with extra rosemary, butter, cream, salt, pepper, and a little grated parmesan. Next the sauce… Pretty simple really… Into the pan juices goes a good few dashes of balsamic vinegar and a good squeeze of honey (I’d give you measurements, but i really didn’t use any… I generally cook to taste and measure things by eye). Give this a taste and you have a lovely sweet balsamic flavour coming through… which I then pulled back to savoury land with the help of a splash of shiraz and dash of beef stock. Reduce the sauce down, and keep stirring to make sure the honey doesn’t seperate, and perhaps thicken with some corn flour and water… and you’re done. At this point I cut all the lamb racks up into french cutlets (if thats what french cutlets are of course… ) and attempted to pile it onto a plate in some sort of attractive formation. Sadly failing… after taking some photos, I heaped the rest of the lamb on top and Sharon and I devoured them as best we could. I’m not the biggest fan of pork, but occasionally like to dabble with it. This is one of my more successful dabblings. The only rule i’ve learnt is that honey and pork go well together (i got that mostly from the fact that most pork flavoured snacks also contain some form of honey flavouring). So it must be a match made in heaven… because this was delicious. Recipe to follow… but for now, note the use of Kipfler potatoes in the salad… tres yummy.